One of our Orlando apartment rentals, which has one bedroom and is situated on the 1st floor with a washing machine, double bed and an oven. We booked our holiday through Karen Durant from Holidays 4U. The Orlando complex has come on a lot from when it was first sold off to private owners around 10 years ago. It is now a quiet, well maintained, residential complex. There are 2 pools on the complex, which are both well maintained. There is also a pool bar, which serves snacks and drinks at reasonable prices. As it is a residential complex, there are normally only a handful of people sitting around the pool. So it never gets overcrowded and it is not difficult to get a sun lounger. No rush at 9am to put towels on beds, like in some other more touristic complexes! The complex is in a great location, being only 5 minute walk to several beaches such as Torviscas Playa or Fanabe Playa where you can also find a great selection of restaurants serving international cuisine as well as some bars. We were very lucky with the weather. We had sun every day, so no complaints there. Our apartment was on the 5th floor with sea and pool views. 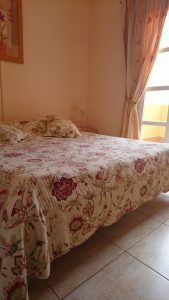 The owner provides satellite TV which included several English channels and there is also free wifi in the apartment. I wold definitely recommend this complex as a good choice for both couples looking for a quiet romantic holiday and also families with children, as it is a safe environment. We will definitely contact Karen soon to talk about another holiday here as the prices are also very reasonable. So far we have already stayed twice on this complex and met some really nice people which we have kept in touch with.